Has anyone heard from Densil at Welsh Models recently? I have been trying to place an order with him but haven't had any responses. He has to be still up and running, the Latest News Letter from the Big H has a couple of items from him listed. Yay! He has gotten in contact with me so all is good. 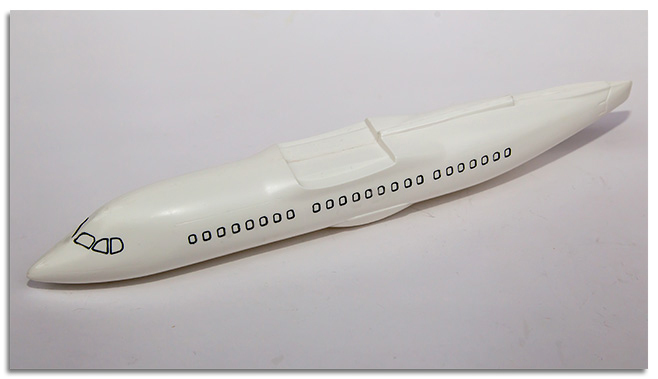 Coming soon: 1/72 BAe 146-200. No pricing yet. 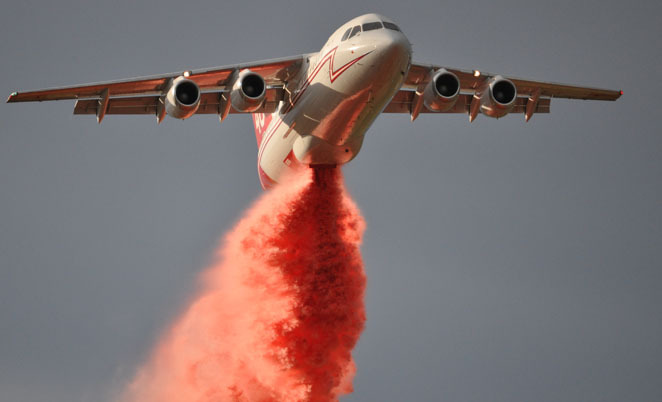 The BAe 146-200 series in 1:72nd scale is due for release early next week as a resin kit with Vac Formed Fuselage. 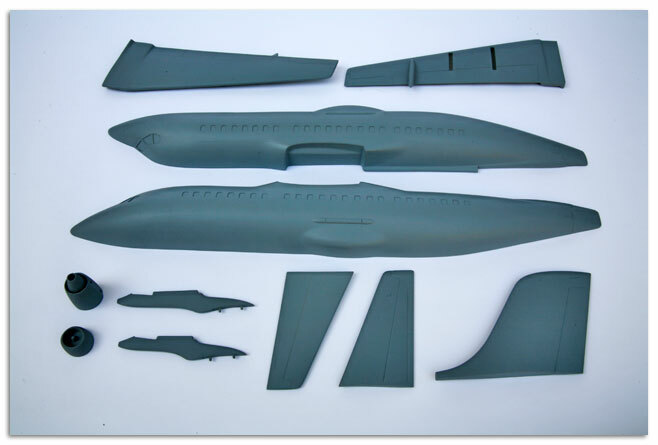 There are in excess of 40 resin parts including a complete detailed cockpit, main undercarriage bay and the option to have the rear airbrake system in either an open or closed position. Decals are by Ray at 2-6 decals in the last Pacific Southwestern Airlines (PSA) livery which had the solid grey titles and horizontal fin flash. Welsh kit page is here. Great base for a MPA or a rough field tactical transport for smaller air forces. There's a 146 still being operated out of YYC (Calgary International), I see it most days. There used to be eight of them parked in the bone-yard but all were sold for converting into water bombers. I had a flew flights in them when Air Canada Jazz used them for the East Coast runs. They would howl when the flaps were extended. Note the very "unofficial" RCAF lightning bolt. I would LOVE one of those for a long-standing project of mine, but it all depends on the price, of course. I used to work at BAE Woodford where the 146/RJ was made, so they're close to my heart. They just posted the price. Are you sitting down Harold with beer in hand? For you 121. For me, $207 CDN. Hmm. Not today I think. No, I was sitting down drinking tea, which I'm now wiping off my screen. Well that project is NOT happening in the forseeable future. I can kinda sorta do it with the 1/144th Revell kit, but I had in mind a diorama with figures too and that would have been better in 1/72nd. We have one new 1:144th scale release and four new conversion kits in the same scale this week. SL 354R - Fairchild FH-227B in Touraine Air Transport, a resin kit with metal propellors - declas by Fantasy Print Shop. CV-30 - Solid Resin Fokker F.27.500 Series Fuselage inc window decals. CV-31 - Solid resin Fairchild FH-227 fuselage along with window decals. CV-37 - Vacform DC-8-50 series fusleage along with resin PW JT3D-3 Turbojet engines along with a United Airlines decal set. 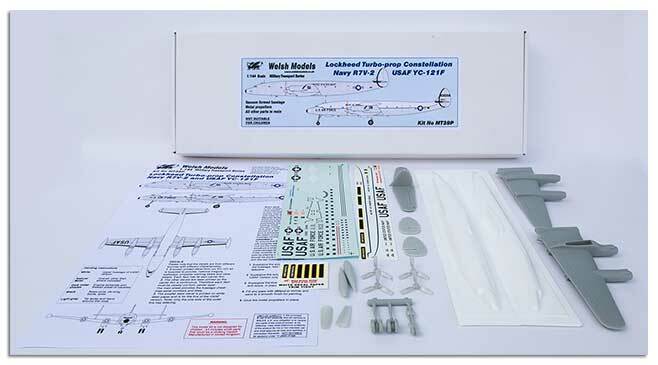 CV-38 - Vacform DC-8-11/21 series fuselage with resin PW JT3C Turbojet engines along with United Airlines decal set. Hmm, could be most interesting to combine with an Anigrand B-30 kit. Agreed. They should offer just the wings in both 1/144 and 1/72. We have finally sold out of MT72-01 - The original Boeing 737-7ES Wedgetail, which will very shortly be superceded by MT72-13 which has many upgraded parts and decals. Likewise MT72-09 has temporarily sold out awaiting replacement parts and when re-issed will offer new upgrades to include operational US Navy Squadrons. One time I was after some of Welsh Models bits & pieces and asked if I could get them, but Denzel replied saying he doesn't split up kits of parts because he doesn't want a pile of in-complete kits lying around. He did say that he would sell all of the resin bits, or all of the white metal bits from a particular kit though, as they come as separate sets from his supplier.